JERUSALEM (AP) — Prime Minister Benjamin Netanyahu sparked an uproar in Israel on Wednesday for suggesting that a World War II-era Palestinian leader persuaded the Nazis to adopt their Final Solution to exterminate 6 million Jews. Holocaust experts and survivors slammed Netanyahu’s comments as historically inaccurate and serving the interests of Holocaust deniers by lessening the responsibility of Adolf Hitler and the Nazis. Critics also said the statement amounts to incitement against modern-day Palestinians in the midst of a wave of violent unrest and high tensions. Speaking to a group of Jewish leaders Tuesday, Netanyahu tried to use a historical anecdote to illustrate his claim that Palestinian incitement surrounding Jerusalem’s most sensitive holy site goes back decades. He has repeatedly said that a wave of Palestinian attacks in recent weeks is the result of decades of hatred, and not connected to Israel’s 48-year occupation of lands claimed by the Palestinians, as the Palestinians have claimed. Netanyahu said the World War II-era grand mufti of Jerusalem, Nazi sympathizer Haj Amin al-Husseini, also instigated Palestinian attacks on Jews over lies that they planned to destroy the Temple Mount, known to Muslims at the Noble Sanctuary. Netanyahu said al-Husseini played a “central role in fomenting the final solution” by trying to convince Hitler to destroy the Jews during a November 1941 meeting in Berlin. While the Nazis’ official endorsement of the Final Solution came months after the meeting, historians note that the Nazis’ mass killing of Jews was already well underway. Several concentration camps were up and running, and Hitler had previously repeatedly declared his lethal intentions for the Jews. If anything, they said it was the Nazis who were trying to use al-Husseini for their own propaganda interests and that Hitler didn’t need any outside inspiration. When Hitler did consider deporting Jews, it was in the context of sending them to countries like Ukraine and Lithuania where they would face persecution or death. Moshe Zimmermann, a prominent Holocaust and anti-Semitism researcher at the Hebrew University in Jerusalem, said Netanyahu made a “far-reaching argument” that didn’t hold up. Al-Husseini was an enthusiastic Nazi supporter who helped recruit Bosnian Muslims to their side and whose anti-Semitism was well documented. But Zimmermann called him a “lightweight” who was pleading with Hitler for assistance in getting rid of the British Mandate and the Jewish immigrants coming to the Holy Land. He said there was no evidence al-Husseini had any real influence on Hitler. Records show that at the meeting, Hitler turned down a request to form a formal treaty. Dina Porat, the chief historian at the Yad Vashem Holocaust memorial, said that al-Husseini’s goal was to have Hitler include the Jews of Palestine in his extermination plans. Netanyahu has long been criticized for invoking the Holocaust when talking about current affairs, alluding to it especially when discussing Iran and its nuclear program. The son of a historian, Netanyahu also has a record of slipping up when citing historical facts. The prime minister’s comments came at a particularly sensitive time, as he travelled to Berlin Wednesday for meetings with German Chancellor Angela Merkel. 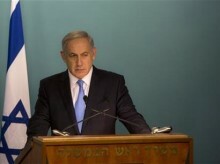 Netanyahu tried to calm the uproar and clarify himself prior to his departure. “I had no intention of absolving Hitler of his diabolical responsibility for exterminating European Jews … at the same time, it is absurd to ignore the role the mufti played,” he said, adding that it was tied directly to Palestinian sentiments today. Husseini is admired among a small group of older, well-educated Palestinians as someone who fought the British and Jewish immigration to Palestine. But the vast majority of Palestinians, particularly the younger generations, have little or no idea who he is. Netanyahu is also set to meet U.S. Secretary of State John Kerry in Berlin in new efforts to bring an end to a monthlong wave of attacks that have raised fears that the region is on the cusp of a new round of bloodshed. Netanyahu has repeatedly accused Palestinian President Mahmoud Abbas of inciting the violence, while Palestinians say years of Israeli occupation are at the root of the unrest. “The question that has to be asked to President Abbas is why you lionize Haj Amin al-Husseini, the Mufti of Jerusalem, the war crime collaborator of the Nazis,” Netanyahu said. In Israel, many quickly accused Netanyahu of going overboard. Opposition leader Isaac Herzog called it a “dangerous historical distortion” that plays into the hands of Holocaust deniers. “It downplays the Holocaust, Nazism and the role of Adolf Hitler in the great tragedy of our people,” he said. Colette Avital, who heads the umbrella organization of Holocaust survivors, said survivors were baffled and Zehava Galon, head of the dovish Meretz party, noted that her ancestors were killed months before Hitler and the mufti even met. “Hitler initiated it, Haj Amin al-Husseini joined him and unfortunately the jihadist movements promote anti-Semitism to this day, including incitement in the Palestinian Authority that is based on the legacy of the Nazis,” he told Israel’s Army Radio. Palestinian officials accused Netanyahu of distorting history. “It is a sad day in history when the leader of the Israeli government hates his neighbor so much so that he is willing to absolve the most notorious war criminal in history,” said senior Palestinian official Saeb Erekat. At a meeting with the visiting U.N. chief Ban Ki-moon, Palestinian President Mahmoud Abbas accused Netanyahu of trying to rewrite history. “Now he says Hitler is not responsible,” he said.